The Ezeep-Operate integration allows you, as an Operator, to provide your customers with any number of printing credits as well as to automatically charge for prints coming from your Ezeep. In a nutshell, Ezeep lets your provide the printing service, while Operate charges for it and includes it in your monthly invoices. In this guide we will be focusing on how you can configure the Ezeep side of this integration for your buildings. Please note that this applies to the main Ezeep app, not Ezeep Dash. Please keep in mind that, if you want to provide large scale printing to everyone within your buildings, this setup needs to be performed on your main machine(s), where your printers are installed. Please go through this configurations on each such machine, in each of your buildings. This is necessary in order to integrate your printers into the Ezeep system; otherwise they will not be made available to your customers. You do not need a server necessarily; but you will need either one main computer to handle all printing; or several, depending on how you would like to manage your physical infrastructure. All computers with installed printers will need to be permanently online in order to allow access to installed printers. If the machine goes offline, so will the printers. You only need to do this once, when setting up the entire system. There is no need for any subsequent configuration, unless you are making changes to your on-site printer network (such as adding or removing a printer). Please see Adding a new printer for further information. You need to be an Admin in Ezeep and have access to the Integrations section in Operate in order to go through this configuration. All Ezeep apps we will be using throughout this guide are available on their 'Get the App' page. Sign into your Ezeep account or register for one, if you haven't already. You can also try Ezeep for 30 days if you are not yet decided and you will still be able to use the integration as well. You will need a Windows machine to set this up, since Ezeep does not provide applications for other Operating Systems. The Connector is used to send/receive the printer information to/from the Ezeep Cloud. It is installed on the PCs (or servers) connected to your printers, on which you should be using the Ezeep admin account.. Accessing Ezeep's cloud platform from a computer with this app installed will give access to administrator tools such as installed printers, users, groups and permissions, etc. Computers without this installed will not have access to these areas; but only to those set within their specific user group. Start the download, then run the setup file. The service will install on your system, as ezeepsetup.msi. You may not receive a confirmation that it has been installed, but if you would like to check, you can do so by going to C:\Program Files (x86), where there should be an "ezeep" folder. 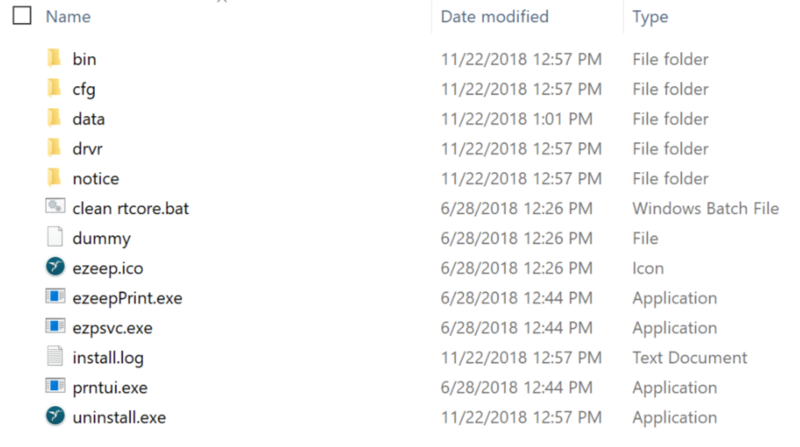 The folder should contain the items below. There is no Mac OS app that links installed printers to the cloud, therefore you will need a Windows based computer as your main, printer connecting machine. The Ezeep Desktop app links the printers installed on your network to user Ezeep accounts. This lets users see all printers they have access to, according to set user policies, even though those printers are not installed on their computer itself. The user of that computer will then be able to print to these Ezeep printers. This app is available for both Windows and Mac. Once the desktop application is installed, users are able to print to all installed Ezeep printers that they have access to (according to the policies explained here). They will be able to print from any Windows or Mac application, where Ezeep printers will have an "e" in front of their name. They can also print from the web, on www.ezeep.com. You can install printers that are assigned to and used by specific groups (e,g, floors); then set up users and permissions to specific printers. Ezeep's Quick Setup Guide provides information on setting up users and policies, once your installation is complete. VIDEO: Configuring eZeep for the first time.